Nickel spot prices were flat in March, as the LME inventory fell further. Nickel market news - Chinese electric vehicle makers are gorging on nickel. Nickel company news - Jinchuan Group's 2018 profits up 60.8% to US$66.9 million. Welcome to the nickel miners news for March. The past month we saw nickel prices flat and plenty of good news from the nickel miners, as well as analysts forecasting a bright outlook ahead for nickel. As of March 25, the nickel spot price was US$5.79/lb, flat from US$5.81 last month. The London Metals Exchange (LME) inventory fell yet again for the month (see LME graph below), and has been rapidly falling since mid-2017. The chart below shows nickel inventory levels have declined and are now getting very low. Note LME nickel inventory is well below the 2014 level when the nickel price was above ~USD 6lb. The chart below shows nickel is forecast to be in deficit after ~2020-2022 (or at least require new supply to come online). Note: Some others such as BMI have been forecasting a nickel surplus by 2020 due to increased Indonesian production and reduced Asian demand. As a reminder, the November 2017 McKinsey report stated: "if annual electric vehicle [EV] production reaches 31 million vehicles by 2025 as expected then demand for high-purity class 1 nickel is likely to increase significantly from 33 Kt in 2017 to 570 Kt in 2025." That is a 17-fold increase in just 8 years, albeit only on Class 1 nickel. A good article I came across from February by Fastmarkets William Adams 2019 is "Interesting times ahead for the nickel market." 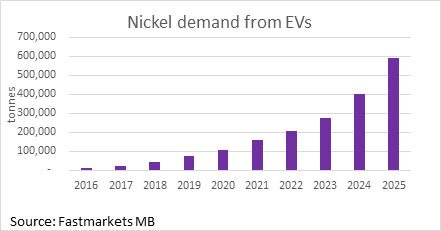 The graph below shows the rapid ramp-up in nickel demand for EVs that is expected from now to 2025. Chinese electric vehicle makers are gorging on nickel. Battery metals tracker Adamas Intelligence says Chinese electric vehicle manufacturers deployed 253% more nickel in passenger EV batteries in January this year compared to 2018. The Dutch-Canadian research company, which tracks EV registrations and battery chemistries in more than 80 countries, says the jump is due to an ongoing shift from lithium iron phosphate (LFP) to nickel-cobalt-manganese (NCM) cathodes.... Nickel used in car batteries jumped 88% in Germany and 54% in the US year-on-year.... The EV boom in China is only accelerating, and Adamas says despite being a seasonally slow month in January 2019, 3.27 GWh of passenger EV battery capacity was deployed in the world's largest car market, an increase of 439% over January 2018 levels. The price of nickel is up more than 20% in 2019 as stocks held in warehouses around the world registered with the London Metal Exchange fall to multi-year lows. Vale plans a US$1.7B Voisey's Bay expansion plan to boost its nickel production. On March 13, Vale SA announced: "Vale informs on the extraordinary independent consulting committee for dam safety." Vale's production and sales in 4Q18. 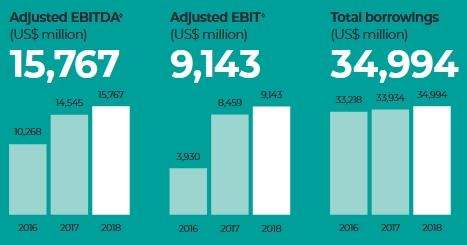 The nickel business transitioned to a smaller footprint in 2018 by adjusting investments and production to reflect current market conditions. Thompson transitioned to a mine-mill operation and Voisey's Bay production was adjusted to match the current mine life to the Voisey's Bay Mine Expansion project. Production was also impacted by the corrective maintenance of the shaft at the Coleman mine in 1Q18. Consequently, production of finished nickel totaled 244,600 t in 2018, 15.1% lower than in 2017. No significant news for the month after last month's record 2018 profit report (Net profit up 44% to USD 3.059b on the back of improved metal prices, higher copper output and sale of palladium from earlier accumulated stocks). Investors can read my article "An Update On Norilsk Nickel." In 2017 BHP announced a US$43.3m investment in its Nickel West project to enable conversion to nickel sulphate. "BHP invests US$6m in emissions reduction company, Carbon Engineering. BHP today announced a US$6m equity investment in Carbon Engineering Ltd [CE], a Canadian-based company leading the development of Direct Air Capture, an innovative technology which has the potential to deliver large-scale negative emissions by removing carbon dioxide from the atmosphere. The investment will see BHP obtain a share of the company." Jinchuan International announces annual results for the year ended 31 December 2018. Profit for the year attributable to owners of the Company up 60.8% to US$66.9 million. Jinchuan Group International Resources Co. Ltd today announced its annual results for the year ended 31 December 2018 ("Year Under Review"). The revenue for the year ended 31 December 2018 was US$1,399,970,000 (2017: 549,188,000), representing an increase of154.9%. Profit attributable to the owners of the company increased by 60.8% to US$66,931,000 (2017: US$41,624,000). Basic earnings per share were US$0.72 US (2017: US$0.89 US) while diluted earnings per share were $0.51 US (2017: US$0.32). The Directors declare final dividend of HK 0.1 cent for the year ended 31 December 2018 (2017: Nil). Net income before significant items rose 5% to $5.8 billion, while significant items reduced net profit attributable to equity holders to $3.4 billion, mainly due to non-cash impairments of $1.6 billion, primarily reflecting impairments of the carrying values of our Mutanda and Mopani assets.......(And re the new DRC mining code)...Given the legal risks of non-compliance, our DRC subsidiaries are currently complying with the new code "under protest". We hope to be able to negotiate a reasonable resolution with the DRC government on various key issues during 2019, but remain willing to take the necessary steps to protect our legal rights. No significant news for the month. On March 14, 4-traders reported: "Anglo American: Floating solar panels to boost efficiency at Chilean copper mine." Sherritt reaches three billion pounds of nickel production milestone. Sherritt International Corporation, a world leader in the mining and refining of nickel and cobalt from lateritic ores, announced that its refinery in Fort Saskatchewan Alberta has reached three billion pounds of finished nickel production since its operations first began in 1954. Sherritt provides update on Ambatovy Joint Venture. Sherritt International Corporation, a world leader in the mining and refining of nickel and cobalt from lateritic ores, announced that, in order to preserve liquidity and protect its balance sheet and consistent with previous disclosure, it will not fund its 12% share of a US$45 million cash call (100% basis) received from the Ambatovy Joint Venture ("Ambatovy JV"). The cash call was made due to the Ambatovy JV's short term liquidity needs. West Kimberley and Fraser Range exploration update: Merlin continues to deliver high grade Ni-Cu-Co sulphide intercepts, 2018 highlights include: DMDD0015 6.60m @ 3.47% Ni eq. from 309.4m within; 14.00m @ 1.88% Ni eq. from 304.0m. DMDD0018 2.19m @ 5.24% Ni eq. from 236.0m within; 6.00m @ 2.40% Ni eq. from 236.0m. DMDD0022 9.90m @ 1.50% Ni eq. from 242.7m within; 15.00m @ 1.06% Ni eq. from 242.0m. Downhole Electromagnetic [DHEM] surveys underway..."
DHEM Surveys at West End Identify Off-Hole EM Conductors..."
Scheme booklet for proposed acquisition by Cobalt 27. Highlands Pacific Limited (ASX/POMSoX: HIG, "Highlands") is pleased to confirm that on 12 March 2019 the National Court of Papua New Guinea ("Court") made orders that a meeting of the holders of Scheme Shares (being all shares in Highlands other than those held by or on behalf of Cobalt 27 Capital Corp. or its subsidiaries) ("Scheme Meeting") be convened to consider and, if thought fit, to approve the proposed acquisition of Highlands by Cobalt 27 Capital Corp. by way of a scheme of arrangement ("Scheme"). Panoramic's Savannah mine and mill is expected to ramp up to full production over 15 months to a forecast life of mine average annual production rate of 10,800 t of nickel, 6,100 t of copper and 800 t of cobalt metal contained in concentrate. "Operations - Decision made to restart Savannah in July and milling commenced in December. Cash flow from operating activities - $3.3million outflow for Savannah site maintenance costs (after consolidating $0.8million of costs incurred at the Gum Creek Project) and corporate costs. Cash flow from investing activities - $22.4 million net outflow including Savannah pre-production costs ($31.7million), Group exploration and evaluation costs ($4.1million) and net Lanfranchi sale proceeds ($13.2 million). Reported net profit after tax- $21.6 million (including $0.8million loss by Horizon Gold Limited). Net current assets - $27.2million. Hedge Book - $19.8 million 'in-the-money'." On March 6, Panoramic Resources announced: "Savannah operations update & amendments to project loan facility...The first shipment of concentrate was achieved in mid-February." On March 11, Panoramic Resources announced: "Placement and underwritten rights issue. Firm commitments received for an initial placement to raise $5 million (before costs). Offer price of $0.38 per New Share represents a 17.4% discount to last closing share price of $0.46." On March 18, Panoramic Resources announced: "Completion of initial placement." Further drill results at San Jorge Island, Isabel Nickel Project. Encouraging grades of saprolite continue to reinforce potential of San Jorge. Drilling also continues to confirm high iron [FE] limonite directly above the higher nickel [NI] grade saprolite providing for a revision of the economic potential of the deposit. "Terms sheet signed with Traxys Europe S.A. for senior debt facilities of up to US$10.5 million and off-take sales arrangements for nickel ore from Axiom's San Jorge project. Traxys is a global commodities trading firm and one of the top nickel traders in the world. Senior debt facilities will fund capital expenditures and working capital to bring the San Jorge nickel mine into commercial production. Off-take sales arrangements overall of Axiom's nickel ore production from its Solomon Islands projects for five years of production. Traxys' marketing and distribution channel to accelerate Axiom's global exposure to existing nickel ore refineries and customers." Franco-Nevada (NYSE:FNV) [TSX:FNV], Mincor Resources (OTCPK:MCRZF) [ASX:MCR], MMG [HK:1208], South32 (OTCPK:SOUHY) [ASX:S32], Lundin Mining (OTCPK:LUNMF) [TSX:LUN], Nickel Asia Corporation (OTC:NIKAY) [PSE:NIKL]. Note: First Quantum Minerals (OTCPK:FQVLF) halted its nickel production from its Ravensthorpe mine in 2017 due to low nickel prices. On March 26, RNC Minerals announced: (gold related news) "RNC Minerals announces purchase option agreement for Westgold's Higginsville Mill and mining operations." RNC Minerals announces $12 million bought deal financing...at a price of $0.49 per Common Share (the "Issue Price"), for gross proceeds to the Company of $12,000,100 (the "Offering"). On March 7, Poseidon Nickel announced: "Poseidon Nickel Limited interim financial report for the six months ended 31 December 2018." "Initial refurbishment of Silver Swan decline has commenced. Exploration Program at Black Swan ore deposit to commence this week." No news for the month. On March 13, Cassini Resources announced: "Interim financial report for the half year ended 31 December 2018." Loan restructuring and further advance. The Convertible Loan of up to US$10 million (of which US$1.2 million has been drawn down and remains outstanding) will have its maturity date extended to 20 March 2020. Ardea Resources (OTCPK:ARRRF) [ASX:ARL], Artemis Resources (OTCQB:ARTTF) [ASV:ARV], Australian Mines (OTCQB:AMSLF) [ASX:AUZ], Cassini Resources [ASX:CZI] (OTC:CSSQF), CleanTeQ [ASX:CLQ], Giga Metals (OTCPK:HNCKF) [TSXV:GIGA], Mustang Minerals [TSXV:MUM], New Age Metals (OTCQB:NMTLF) [TXV:NAM], Nickel Creek Platinum [TSX:NCP] (OTCQX:NCPCF), Pancontinental Resources Corporation (OTC:PUCCF) [TSXV:PUC], Polymet Mining (NYSEMKT:PLM) [TSX:POM], S2 Resources (ASX:S2R), St George Mining Ltd [ASX:SGO] [GR:SOG], Transition Metals (OTC:TNTMF) [TSXV:XTM], and Wall Bridge Mining [TSX:WM]. Note: Some of the above companies are covered in the Cobalt monthly news. Nickel spot prices were flat in March. Nickel inventory levels continue to drop, suggesting if demand remains strong and new supply remains constrained, then nickel deficits may become a bigger issue in 2020. Chinese electric vehicle makers are gorging on nickel. Chinese electric vehicle manufacturers deployed 253% more nickel in passenger EV batteries in January this year compared to 2018. Vale's Voisey's Bay nickel production totaled 244,600 t in 2018, 15.1% lower than in 2017. Jinchuan Group's 2018 profits up 60.8% to US$66.9 million. 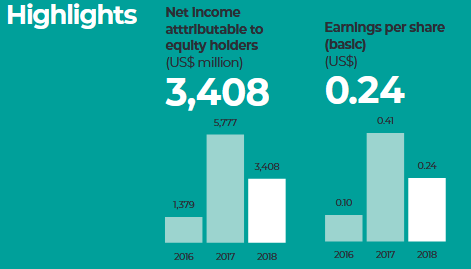 Glencore's 2018 net profit attributable to equity holders drops significantly to $3.4 billion, primarily due to $1.6 billion impairments of the carrying values of our Mutanda and Mopani in the DRC. Sherritt will not fund its 12% share of a US$45 million cash call (100% basis) received from the Ambatovy Joint Venture. Panoramic Resources' first shipment of concentrate from Savannah was achieved in mid-February." Axiom Mining achieves excellent drill results at their Isabel Nickel Project (Solomon Islands); US$10.5 million finance and nickel ore off-take with Traxys Europe S.A.
Poseidon Nickel - Black Swan operations refurbishment and drilling to commence. Disclosure: I am/we are long NORILSK NICKEL [LSE:MNOD], GLENCORE [LSX:GLEN], RNC MINERALS [TSX:RNX], AXIOM MINING (ASX:AVQ), ARDEA RESOURCES [ASX:ARL], AUSTRALIAN MINES [ASX:AUZ], POSEIDON NICKEL [ASX:POS], SAMA RESOURCES [TSXV: SME]. I wrote this article myself, and it expresses my own opinions. I am not receiving compensation for it (other than from Seeking Alpha). I have no business relationship with any company whose stock is mentioned in this article.